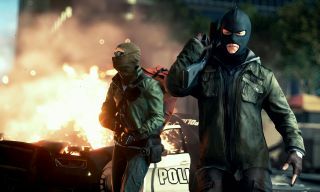 EA's Battlefield games, generally speaking, aren't known for the strength of their single-player campaigns, and Battlefield Hardline looked set to stick to that tradition when it was first revealed as a multiplayer cops-and-robbers blast-fest . But EA seems determined to make single-player a relevant part of the experience, and the 12-minute-long gameplay trailer released today suggests that it might actually be able to pull it off. I won't go so far as to say that I buy into EA's assertion that this represents a "new style of storytelling, inspired by the most popular crime dramas on television today." If anything, it looks like somebody mashed up Far Cry 4 with a Starsky and Hutch rerun, with special guest director Robert Rodriguez. But you know what? That actually sounds like a pretty cool idea—if it works. The first trailer for Hardline's "highly competitive" Rescue mode , a SWAT-vs-goons escapade that tasks players with saving innocent hostages from murderous criminals, also went online today. There are obvious echoes of Ubisoft's Rainbow Six Siege , but without all the fortifying, pre-mission recon and that sort of thing, and overall I think it comes off as somewhat less impressive. Can EA pull off a meaningful single-player mode in Battlefield Hardline—and is it something that players even want? Precedent is against it, but at least it seems to have a pretty good starting point. Barring further delays , Battlefield Hardline will be out in early 2015.